This 28-inch retractable downdraft vent from Whirlpool rises 14-inches to help filter steam from tall stockpots, and remains flush with the cooking surface when not in use. Its unique vent system is reversible to help fit in your kitchen cabinet space and its 600 CFM Pro Motor offers the power necessary for effective venting for most cooktops or ranges. Make the most of your space with this Microwave Hood Combination Oven. Enjoy multiple microwave cooking options with a built-in ventilation system and 3-speed fan control. The 300 CFM motor clears smoke, grease and odours in the kitchen while you cook. Use Defrost and Quick Start features for items you need in a hurry. Plus, bright dual lighting illuminates your cooktop area. This convertible under-cabinet hood from Maytag is designed to easily work with smaller cooking appliances, and combines stylish design with efficient ventilation. It features a high-performance 400-CFM blower, three-speed settings and dual halogen lights for bright illumination of your cooking space. Cook for the family, even on a hectic schedule with our 5.0 cu. ft. front control gas range with cast-iron grates. This cooking range is designed with features that help you get dinner to the table quickly. Skip preheating for favourites like pizza and lasagna with Frozen Bake technology. Cleaning your kitchen range is simple with adjustable self-cleaning settings that take on all kinds of messes. Skip preheating with Frozen Bake" technology. This freestanding gas range with self-cleaning oven lets you cut out routine steps so you can get dinner items like pizza and lasagna and lasagna from the oven to the table faster. Get quick access to spills, too, with EZ-2-Lift" hinged grates that let you wipe up under them without removing them. 36-inch Custom Range Hood Liner in Stainless Steel This 28-inch retractable downdraft vent from Whirlpool rises 14-inches to help filter steam from tall stockpots, and remains flush with the cooking surface when not in use. Its unique vent system is reversible to help fit in your kitchen cabinet space and its 600 CFM Pro Motor offers the power necessary for effective venting for most cooktops or ranges. 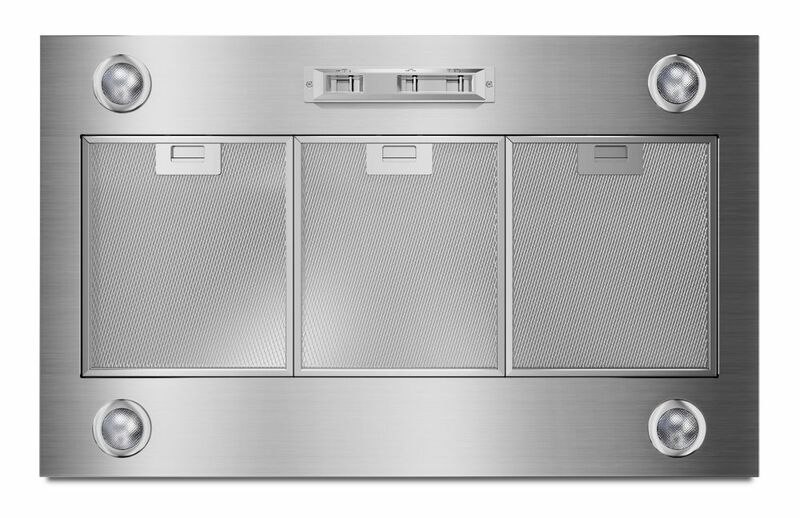 36-inch Custom Range Hood Liner in Stainless Steel is rated 5.0 out of 5 by 2.